In a large pan melt corn syrup and sugar on medium high heat until sugar is dissolved. Do not heat too long or it will make your mixture tough. Turn off the heat and stir in peanut butter, white chocolate chips, and orange food coloring. Add the orange food coloring to desired color. I like the Wilton brand colors because they are very bright. You want to mix it quickly so that it doesn't cool down too fast. If it does cool down too fast turn the heat back on for a second. Stir in the Reese's Puffs® and coat as well as you can. Don't worry, when you form your pumpkins it will get more incorporated. When it is cool enough to handle start making golf sized pumpkin balls, forming well with your hands. Quarter the green gumdrops and use two slices for the pumpkin leaves. Growing up as the youngest of ten kids, we rarely ever were lucky enough to have cereal for breakfast. Since money was tight we usually ate oatmeal or cracked wheat from our food storage. So when one of these boxes of cereal would magically appear in our pantry, it caused major chaos in our home. We all would sit in a circle and divide the cereal equally, one piece of cereal at a time, until the entire box was distributed. Of course if it was Lucky Charms, the marshmallows were divided first. And if one of my brothers or sisters happened to be sleeping...too bad. You snooze, you lose. When I was invited by General Mills and Betty Crocker to come up with a Halloween themed treat using one of their Big G cereals I was in heaven. I was able to try six of the Big G cereals and had them ALL to myself! Of course I gravitated towards the Reese's Puffs because you know me and peanut butter have a thing. After experimenting all day in the kitchen, I finally came up with these cute peanut butter and white chocolate Pumpkin Patch Puffs. 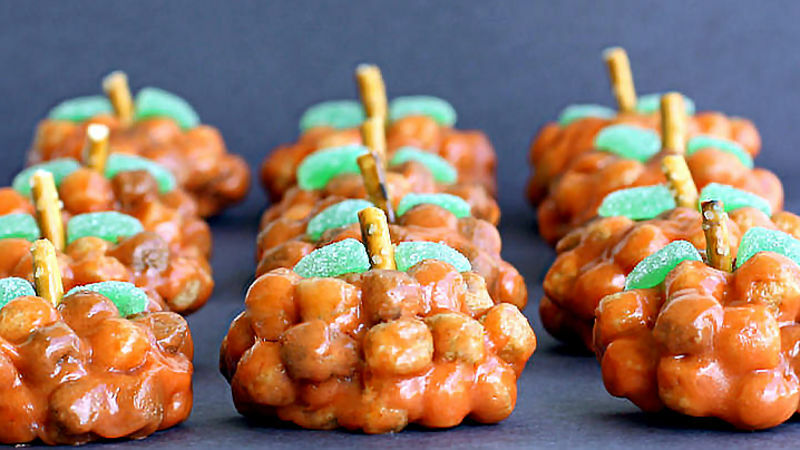 They are an easy treat that you can make with the kids and give away to your friends. Christy joined the Tablespoon team to share her recipes and inspire family food fun. Watch her Tablespoon member profile for great new recipes and check back right here for more of Christy's posts!